The Role of Ammonites in the Mesozoic Marine Food Web Revealed by Jaw Preservation. I. Kruta, et al. Science 331: 70-72. 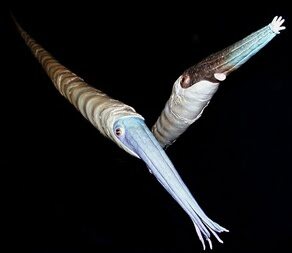 Powerful new synchrotron scans of Baculites fossils suggests that the extinct group of marine invertebrates to which they belong, the ammonites, had jaws and teeth adapted for eating small prey floating in the water. One ammonite also provided direct evidence of a planktonic diet because it died with its last meal in its mouth—tiny larval snails and crustacean bits. Ammonites are extinct relatives of the squid and octopus; the Nautilus is similar in appearance to many ammonites but is a more distant relative. Ammonites appeared about 400 million years ago (the Early Devonian) and experienced an explosive radiation in the early Jurassic. Ammonite jaws lie just inside the body chamber. New scans of Baculites, a straight ammonite found worldwide, confirms older research that ammonites had multiple cusps on their radula, a kind of tongue covered by teeth that is typical of mollusks. The radula can now be seen in exquisite detail: the tallest cusp is 2 mm high, tooth shape varies from saber to comb-like, and teeth are very slender. The jaw is typical of the group of ammonites (the aptychophorans) to which Baculites, belongs.